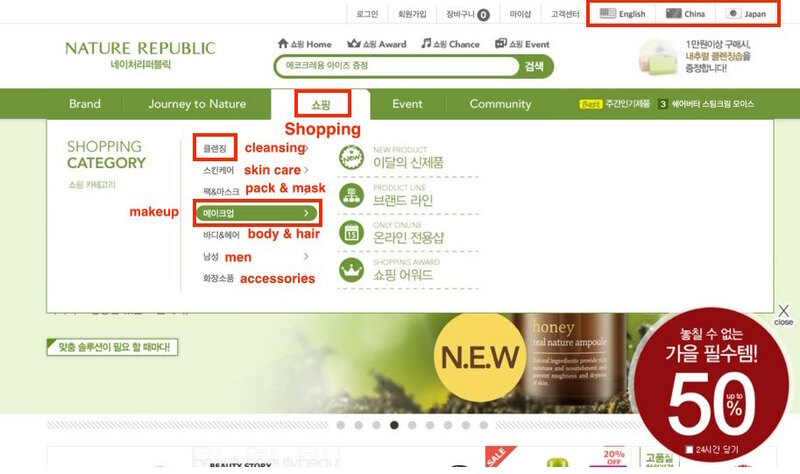 In this guide I am going to show you exactly how to find specific items, decide on product options and the get the required information to order off of Nature Republic (네이처리퍼블릭) using KoreanBuddy. I chose Nature Republic for 3 reasons. 1. It’s one of the most popular cosmetic brands in Korea. 2. The English website is useless so you have to use the Korean version. 3. 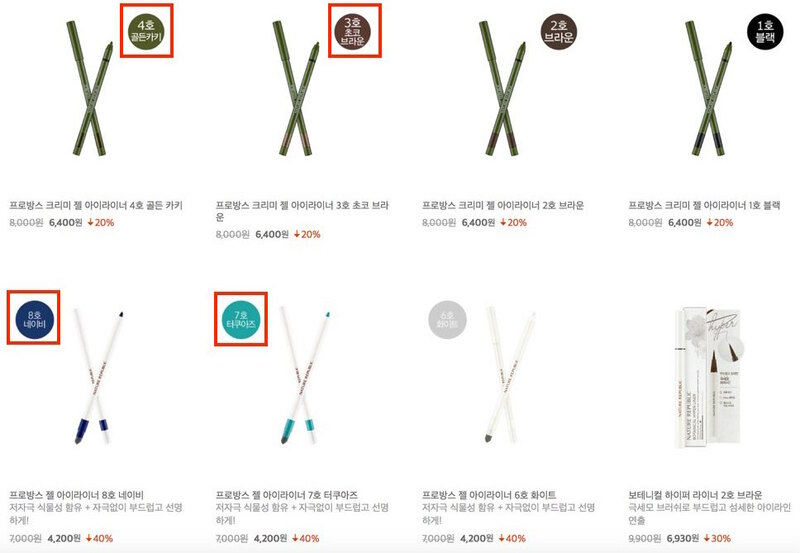 The Nature Republic site has very good prices. Tip #1 – Spend more than 9,900 won and delivery is free in Korea. This is a site wide policy. Tip #2 – After viewing a product and clicking the back button, the site takes you back 2 pages. So when I am looking at eyeliners and click one specific eyeliner, when I click to go back it takes me all the way back to the makeup menu, not the eyeliners. Little bit annoying. Tip #3 – I translated all the sub-menus at the bottom of this post because I want to help you as much as I can. 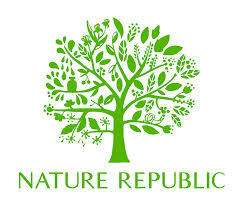 Nature Republic is known for their natural skin care products. They are all about green ingredients and marketing. Even their stores are covered in green plants. You can see this on the English version site. When you browse the website you’ll notice, like The Face Shop, the URL never changes, don’t worry about that, just make sure you let me know the company and copy the whole product description when ordering. In the top menu, ‘Brand’ talks about the company itself. ‘Journey to Nature’ has stories about the different product lines. If you want to read about these stories then check out the English site. They do have some of this information there and you can learn more about the product ingredients. ‘Shopping’ is where we are going to start. I am going to search for eyeliner and an oil based cleanser. Take a look at the translations below and use the cosmetics glossary if you need more help. 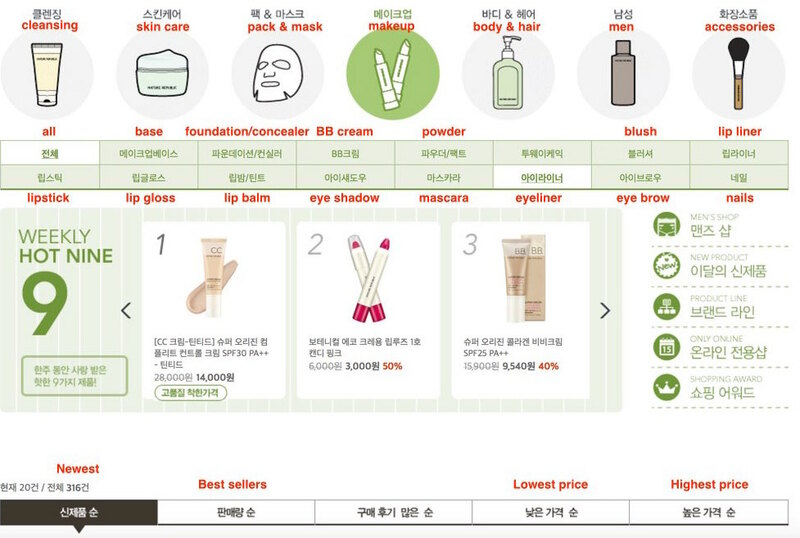 Prodcut #1: Eyeliner – start by clicking on make up “메이크업” and then you will see the sub-menus. From here we are going to click on eyeliner “아이라이너” shown in the picture. Near the bottom of this picture there is a menu you can sort the products, newest, top sellers, , lowest prices, highest prices. The product descriptions are all in Korea, so if you need help just send me a message on the chat. In the listings the colors are shown as circles next to the product. I’m going to get the new white case eyeliner because it’s a really cool design and you get 4g which is way more than the other products. 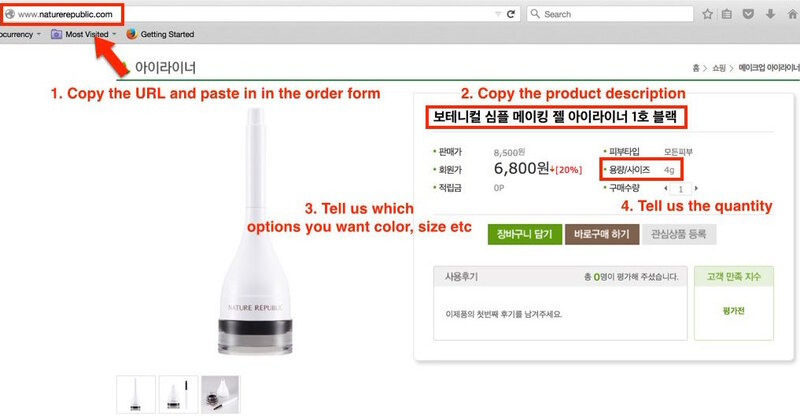 To order 1. copy the URL and paste it into the order forms on KoreanBuddy 2. copy and paste the product name. 3. Tell us the options you want like color and size. 4. Enter the quantity. There are only 9 products listed and I am going to choose the first one because it’s 500mL compared to the others 200mL so it’s a better deal. I did search some other sites and it seems to be the cheapest on this website. 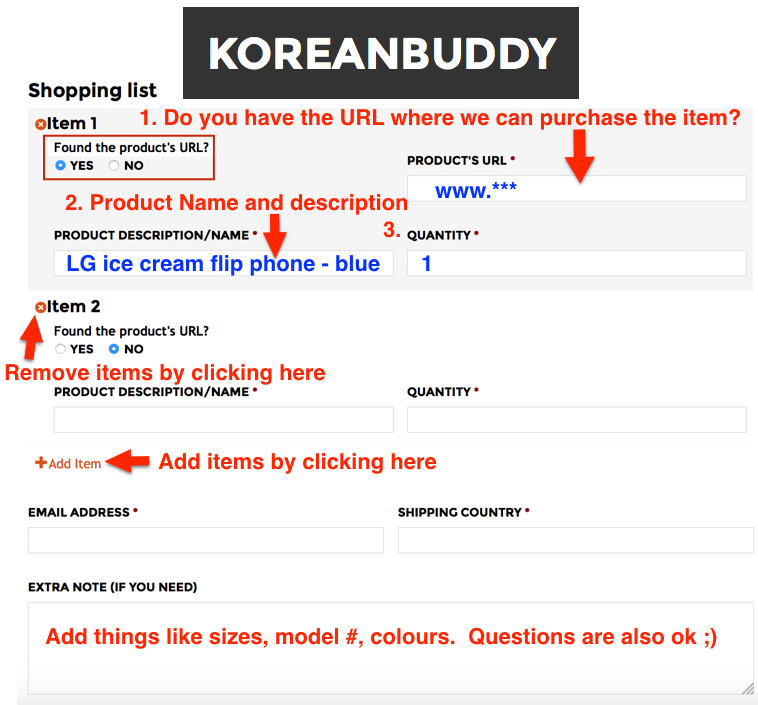 To order 1. copy the URL and paste it into the order forms on KoreanBuddy 2. copy and paste the product name. 3. Tell us the options you want like color and size. 4. Enter the quantity. There are product reviews at the bottom of each product page although some products have no reviews listed. There is also rating on the product page as seen in the picture below. The rating is out of 5 stars and 10 points. It also shows how many people have commented on the product. If you ever need help with this website or any other,feel free to send me a message through the chat. I will get back to you quickly.